P. F. Wagler, U. Tangen, T. Maeke, H. P. Mathis, J. S. McCaskill, (2003) Smart Materials and Structures , 12, 757-762. P. F. Wagler, U. Tangen, T. Maeke, S. Chemnitz, M. Juenger, J. S. McCaskill, (2004) in Smart Structures and Materials (SPIE Proc.) 5389, 298-305. The microreaction chamber systems has been produced by soft-lithography. The main fabrication steps are as follows. 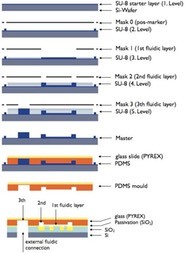 A silicon wafer with multi-plane patterned photoresist combination of SU8 serves as a mould master. For polymer moulding a solution mixture of PDMS prepolymer and the curing agent is then cast against the master. Curing the polymer and releasing it from the master yields a replica containing three levels of different heights of the desired microchannels and -chambers. 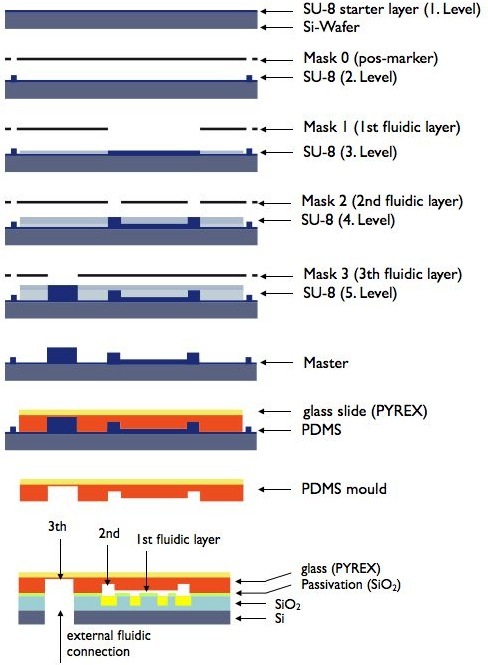 The resulting PDMS moulds have favourable optical properties for fluorescence-based detection, due to the fact that PDMS has almost no absorbance and minimal auto-fluorescence in the range of visible wavelengths. (or optionally with the electronic layer of an FPFA chip containing a combinatorial array of microelectrodes). The connection of the biochips to an external fluidic handling system was achieved via plastic capillary tubing of 18 connected high aspect ratio etching holes (0.3 mm diameter) in the silicon-layer and fixed with an adhesion technique specifically developed for plastic tubes (inner tube diameters are 200 μm).